A: You were in London working for the UK innovation Agency Nesta. Why did you accept the offer from the Barcelona Mayor Ada Colau? F: I was working for Nesta and had already done a lot of work on a European level and with movements around open access, democracy and technology for social good. I was excited to come work for the new government in Barcelona because they have a very new approach to the city. They were making it clear that you cannot have a digital revolution without a democratic revolution. It was the start of my mandate to rethink the smart city, not just in technological terms, but in ways that put citizen needs and the city’s (political) questions at the core. A: What have some of the key actions been on the Barcelona agenda since then? One key point is access to housing. The government is not only tracking down big banks that leave apartments empty but also confronting platforms like Airbnb whose business model has a negative impact on affordable housing. Another big theme is energy transition and renewable energy. Barcelona wants to create a municipal energy company to fight the current monopoly. We are also looking into more distributed energy models, like smart grids, models that are more affordable and which allow citizens to be in control of their data. We are also rethinking urban planning with projects like the SuperBlocks (Superilles). Aimed at giving back public spaces to citizens, they were created in a very innovative process with a digital democracy platform for large-scale citizen participation. Opening the debate brought many great ideas, but it also showed us the complicated aspect of participation. There were many conflicting interests and it was learning by doing in an iterative way. Finally, instead of working only with big companies as governments typically do, we are also rethinking the economic model to support new economies like the solidarity, collaborative and digital economy. This also helps us fight corruption since often a lock-in of the public administration with big companies leaves little space for other players. A: Sounds like there are some real challenges ahead. How did you start to address them and what’s the role of technology here? Over the past year, I created a Barcelona Digital City plan to address how technology and data can help solve urban challenges. It’s divided into three main areas. The first is digital transformation of the government through technology. This involves aspects like procurement -how we purchase technology - avoiding lock-in by working with smaller companies and ensuring that public money is invested in open technologies. To increase transparency, the city hall is also testing an open and participatory budgeting system in Barcelona neighbourhoods with the Gracia project for example, which then can be scaled up. Together with the activist group X-Net we have also created - and this is pretty unique- an encrypted infrastructure TOR that is integrated into the main city infrastructure. It functions as a whistleblower tool for public workers to denounce cases of corruption and help us open up the public administration. In terms of procurement, we are also integrating clauses that address sustainability, gender and the solidarity economy. The goal is to get citizens more involved in how their money is spent and make them part of the procurement process. The citizens are very transparent, but the power must be transparent! We are also focusing on digital innovation with the new socio-economic innovation activity line inside Barcelona Activa as well as an incubator and accelerator for tech companies. 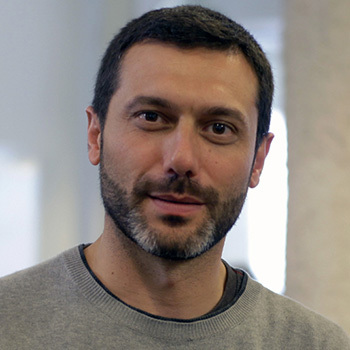 However, most innovative are programs for digital social innovation (associated with https://digitalsocial.eu/) that acknowledge the impact of open technology on the economy, democracy and manufacturing. 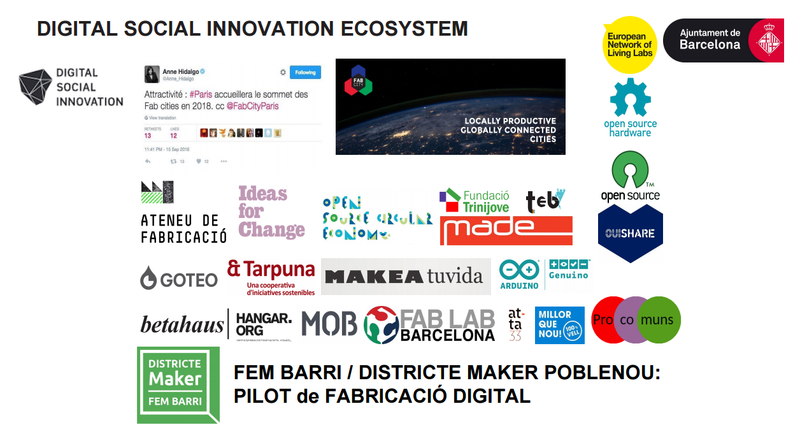 The Barcelona MADE project for example (Maker District in Poblenou or hosting the MakerFaire) is aimed at rethinking the future of production in cities and urban manufacturing in a circular economy way. It’s important that cities regain some industrial capacity to make them more sustainable again. The third aspect addresses digital empowerment and collective intelligence. We are expanding this to many areas like city planning, cultural activities and citizens initiatives with experiments like PAM. But above all, the digital education project is aimed at rethinking education and the future of work. We not only need new skills to be able to transition to the digital society- or should I just say future- but in a time of extreme automation, we also must invent new jobs. Along these lines, we are piloting a basic income scheme related to digital currency infrastructure as part of an EU-funded project. Barcelona also recently hosted an international conference about alternative currencies. A: A core topic in this tech strategy is “City Data Commons”. Why is data so important? The question of data ownership and sovereignty, or “City Data Commons”, is particularly important because it raises the question of how we can make the most out of data by putting the digital right of the citizen at the core. In a world where machines are doing more and more, it’s important to acknowledge that this data belongs to the citizens, not governments. Cities should act as the intermediary and as custodians of these new rights. Cities are responsible for ensuring that data sovereignty is respected. They should act as an intermediary and as custodians of these new rights. A: What are the mechanisms you can put in place to progress in this direction? One way to go is by changing the regulations. Another way is through decentralised and encrypted infrastructure that makes citizens aware of how the data is used. At the moment, when you use a digital service it’s not necessarily clear what happens to the data and how it’s monetized. People sign some terms of contract but it’s all very opaque. DECODE is a new 5 million Euro project we are currently working on together with 14 partners across Europe. We are experimenting with encrypted decentralized data management architecture using blockchain and distributed ledgers to make these data commons clearer. A: There is no lack of technical tools. But are we, both citizens and administration, culturally ready for it? Tools are not just technical devices, but regulation, economic models, technical infrastructure and cultural organizational change. Making them align is the difficult part, The problem is definitely not the tech, but the culture and the institutional boundaries. Even though at the moment there are citizens in the government who don’t think like bureaucrats, they still have to work within certain boundaries. Institutional hacking is great, but to truly expand these it must come from the bottom up. Sure you also need the right people in power, but if society can’t enter and do things, monitor and track activities, nothing will change. A: For all these ideas Barcelona has been named a Rebel City, but you are not alone in this, right? What are the best practices to connect with like-minded cities? What cities are interested in Barcelona’s developments? It’s interesting to see how in hard times cities are coming together to solve problems that governments are not (such as immigration, access to water, energy and affordable housing). These solidarity networks are important because they empower people with the feeling that you can actually transform something. Although we need to keep the big vision in sight, what we are doing institutionally are small but irreversible changes. 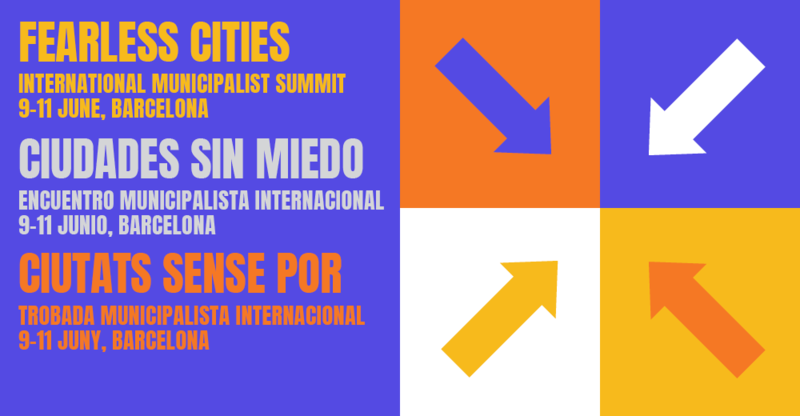 Barcelona just hosted The Fearless Cities Municipalist Summit to strengthen links with like-minded cities as well. Cities are also coming together to create a more local collaborative economic model that doesn’t rely on big US corporations who dominate the market and take all the data. Regulation is one difficulty, but mainly we need to ensure that collaborative economy models that have a positive local impact can grow and flourish. We are collaborating with cities like Berlin, New York, Moscow and Amsterdam on this and demanding that big platforms give us their data. We need algorithmic transparency to regulate and understand the business model. Currently, it’s a black box. Absolutely. Cities have to solve all these challenges but they have neither the law-making power nor the fiscal leverage. This is a conflict that we see happening a lot in Spain, and it’s a complex dialogue between city and state. One way European cities are circumventing this is by articulating themselves as metropolitan areas within a region. The European investment bank is working with cities and regions for example, and also the fact that cities are municipalization infrastructure is interesting. The example of the rebel cities shows that despite fiscal and law making limitations, governments are beginning to feel pressure from cities. Nevertheless, I believe in federalism, as you need to be able to work at different levels, city, regional, national, global and European. And you have to make them work together. A: Let’s fast forward to the future. When citizens are fully empowered, what will be left for the public administration? We will see after the mandate in Barcelona, but the fact that you can have a citizen movement enter the institution, govern and take power shows that there is already a new approach in policy in terms of political class. This is not a cyber thing, a purely digital model, but the opposite. I think we are going towards hybrid models where citizens will have a type of self-governance and be directly involved in things like allocating budget, taking decisions and managing projects. I really believe that the future will be more and more of these political movements and approaches that are based on the common good. Meet Francesca Bria at OuiShare Fest, she will share a new exciting vision of where city governments start to think and experiment with what technology would look like if it served the people. How can technology lead to more participation in democratic processes? Who should own and control city data? Can cities embrace a model that socializes data and encourages new forms of cooperativism and democratic innovation? 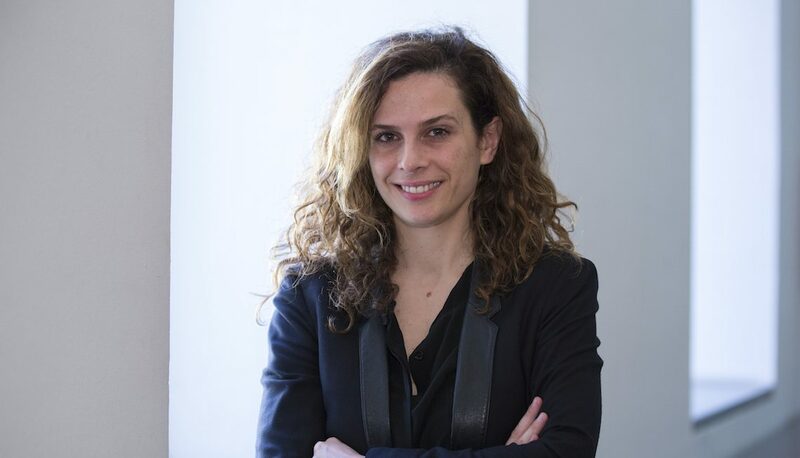 In the run-up to the OuiShare Fest Paris, Albert Cañigueral interviewed Francesca Bria, the chief innovation officer of Barcelona. Comment renouveler l’expérience du vivre-ensemble grâce à la création artistique. “Grâce à vous, j'aime ma ville, j'ai rencontré plein de gens, chanté, dansé, jusqu'à 4h du matin". Voici le type de témoignage que Dan Acher, social artist et fondateur de Happy City Lab reçoit à la suite de ses projets lorsqu’on le reconnaît dans les rues de Genève. Par son travail, il réussit le tour de force de créer des moments de partage et de convivialité sur des places de ville anonymes. Nous l’avons rencontré pour qu’il nous parle de sa vision de la ville et de son rapport à l’art. Alors qu’une majorité des salariés se rend encore sur son lieu de travail en voiture, comment les nouvelles mobilités peuvent-elles se diffuser et détrôner l’auto-solisme ? “Avec les Riverains, nous avons créé un réseau ouvert de compétences et d’entraide sur le territoire”. Simon Laurent est coordinateur et chargé de développement du Tiers-Lieu Les Riverains à Auxerre. Pour lui l'émergence des Tiers-Lieux témoigne d’un changement des mentalités et des pratiques professionnelles, mais aussi d’une nouvelle vision de l’action publique. Digital divides mirror social inequalities. Fostering inclusion and participation can not only lead to better digital services but ultimately more democratic and just societies. Des civictechs aux civicthèques : où sont les lieux de nos mobilisations ? Ronds points, péages, places… le mouvement des Gilets Jaunes le montre : la mobilisation ne passe pas tant par l’utilisation d’outils numériques que par la réappropriation de lieux sur tout sur le territoire. En ces temps de Grand Débat National, nous avons plus que jamais besoin de “civicthèques” : des espaces ouverts pour apprendre et exercer la démocratie sur du temps long dans notre pays. Et si on transformait nos lieux de travail en moteurs de la révolution écologique ? Le 12 février dernier, dans le cadre de la semaine du climat de Morning Coworking, nous avons organisé une soirée sur le lieu de travail comme moteur de la révolution écologique, à Morning OS, à Bagnolet. Nous avons rassemblé des entreprises curieuses, des pionniers et des acteurs bagnoletais qui agissent sur ces enjeux au quotidien. Et voici ce que l'on en retient. Chers contemporains, nous voilà devenus des Homo Numericus, des Hommes augmentés de smartphones, en quête de simplification et d’optimisation de notre quotidien pour se déplacer, communiquer, travailler, s’informer. Quelques entreprises, en échange de services dont il devient de plus en plus difficile de nous séparer, accumulent des données qui font de nous de meilleures cibles publicitaires. Et nous nous en satisfaisons. Et dans un même élan, ce sont nos sociétés qui se numérisent : l’État remplace les services publics par des sites Internet et les collectivités créent des plateformes de participation. Nous voilà devenus de bons citoyens numériques et notre société subit sa mise à jour : société 2.0, société numérique ! Que se passerait-il si nous reprenions le pouvoir ?